Personalised Rajasthan tour packages offered by Shine Gold Tours show you the best of the Indian desert state. You will be amazed to see the grandeur of forts and palaces in the various cities of Rajasthan. If you’re a nature and wildlife lover, Rajasthan will be no less than heaven for you. Take a trip to Rajasthan to spend quality time in the forests of some of India’s finest wildlife sanctuaries. Our religious and spiritual tours to Rajasthan give you an opportunity to rejuvenate your mind in the beautiful temples of the state. 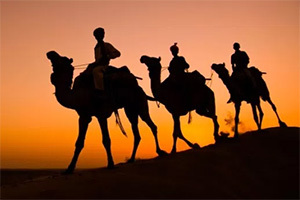 This tour package is designed to let you experience the beauty of desert regions of Rajasthan. The package lets you explore various forts and palaces located in the different cities of the state. The package will show you the rich culture and heritage of this royal, exotic and colorful state. In this Rajasthan holiday package, we cover most of the royal palaces, forts, castles and museums. Let us know the city of your choice and we will arrange your hotel, sightseeing and provide a local guide in the city. Note: Daily meals are not included unless mentioned in the itinerary. Entry fees to the monuments, forts and museums are not included in the price of any Rajasthan tour package offered by us. Breakfast, accommodation, local sightseeing, all road taxes, and fees for driver and guide are included in the package. Jaipur, popularly known as the Pink City, is the state capital and largest city of Rajasthan. It’s a modern city but very rich in heritage, culture and architectural beauty. The city has many royal historic buildings, grand forts, majestic palaces and beautiful temples. The places most visited by tourists in Jaipur are Amber Fort, Jantar Mantar, City Palace, Birla Mandir, Sheesh Mahal, Hawa Mahal, Jaigarh Fort, Nahargarh Fort, Jal Mahal, Albert Hall Museum, etc. Don’t forget take a walk around the Pink City bazaar (market). Jodhpur is another city located in the Thar Desert of Rajasthan. 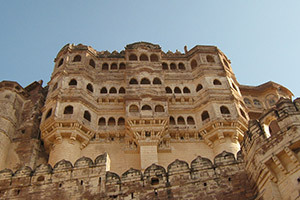 Mehrangarh Fort was built in the 15th century. The palace has become a museum to display local art, weapons, paintings and other artefacts. Other places you might want to visit during sightseeing in Jodhpur include Umaid Bhawan Palace, Jaswant Thada, Balsamand Lake and clock tower. Udaipur is one of the oldest cities of Rajasthan, founded in 1559 by Udai Singh II. It was the capital of Mewar in old times. Royal palaces, temples and the beautiful lakes of Udaipur are popular among travelers. The major tourist attractions are Lake Pichola, City Palace Udaipur, Lake Fatehsagar, Bagor Ki Haveli, Fateh Prakash Palace, Jaisamand Lake, Jagdish Temple, and Eklingji Temple. Pushkar city is set on the Pushkar lake. It is a sacred place for Hindus and often called the Land of Lord Brahma. There are 52 ghats for pilgrims’ bathing and hundreds of temples where millions of devotees visit from all over the world. Brahma Temple, Savitri Temple, Old Rangji Temple and Varaha Temple are a few of the more famous sites. Situated in Aravalli hills, Mount Abu is probably the only hill station in Rajasthan that is popular among tourists. Dilwara Temples, Naki Lake, Guru Shikhar, Mount Abu Wildlife Sanctuary and Honeymoon point are the sites to visit in Mount Abu. Jaisalmer is situated near Thar desert. Travelers come here to see the World Heritage site Jaiselmer Fort. Patwan ki Haveli, Jain Temple, Gadhi Sagar, Salim Singh ki Haveli and sunset in Bada Bagh are other attractions of the city. Ranakpur village is located in Pali district between Udaipur and Jodhpur. Chaumukha temple is famous, with its 1444 pillars and 29 halls. Ranakpur Jain Temple and Surya Narayan Temple are the main religious sites to visit in the city. Kumbalgarh fort is the most important fort in the Mewar region after Chittorgarh, and a major tourism destination. It was built in the 15th century by Maharana Kumbha. Chittorgarh in the south of Rajasthan is situated on the banks of the Berach and Gambhiri rivers. Sightseeing in the city could take in Chittorgarh Fort, Vijay Stambh (Tower of Victory), Ranakumbha Palace, Kirti Stambh (Tower of Fame), Meera Temple, Fateh Parakash Palace, Sammideshwar Temple, and Padamni Palace. Bundi is a small city in the Hadoti region of Rajasthan. Places to visit in Bundi are Taragarh Fort, Garh Palace, Step Wells, Sukh Niwas Mahal, and Dhabhai Kund. Here you can also take a walk to the local market – you won’t be disappointed. The city is known for Ranthambore National Park and Tiger Reserve. Apart from going on a tiger safari in the evening, Ranthambore fort, Rajbagh Talao, the Bakaula area, and Padam Talao are also must-sees. Bharatpur is located in the Brij region of Rajasthan and the city is known for its bird sanctuary that has more than 300 bird species. Other places to visit are Keoladeo National Park, Deeg Palace, Lohagarh Fort, Government Museum, and Ganga Maharani Temple. Mandawa is a small town in Jhunjhunu district in Shekhawati region. On the way you’ll see beautiful traditional villages full of life and colour. Mandawa fort, Goenka double haveli and Jhunjhunwala haveli are the places you may like to visit. Vibrant Bikaner is a desert city in the northwest of Rajasthan state. Sightseeing in Bikaner should include Junagarh Fort, Jain Temple Bhandasar, Gajner Lake, Lalgarh Palace and Museum and Shri Laxminath Temple. Go for an evening walk in the bazaar (market) and shop for traditional wares. Khuri is a traditional desert village in the Sikar district of Rajasthan state. It is known for its sand dunes. Enjoy bonfires, folk songs and traditional dance under the open sky in the desert. Note: With custom Rajasthan holiday packages, you will have the freedom to include any of these cities in the tour itinerary.